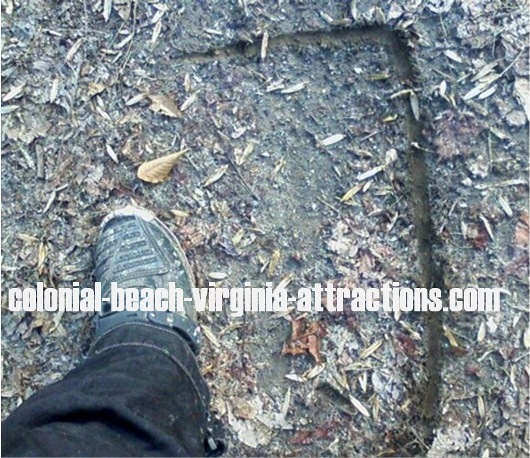 Does Bigfoot Visit Colonial Beach? It is highly likely that bigfoot or sasquatch can exist in the Colonial Beach area. There are plenty of food sources like orchards, deer and rabbits and there is a lot of wooded land as well as farmland with lakes, ponds, creeks and streams. It’s perfect habitat for these creatures. There are even a smattering of sighting reports that show this to be true. According to rivahresearch.com, there were reports of strange odors and nocturnal screams from the mid to late 1970’s through the early 1980’s. A sighting took place on June 20, 1985 when a local family spotted a tall, ape-like creature in their backyard with bright, glowing eyes. Activity continued later that summer, and on into 1986 and ’87. Fast-forward to twenty-some years later, where reports of a “bear” were seen in an Oak Grove subdivision in 2009. Possible sasquatch? My man and I went riding our ATV's on a friend’s property near Colonial Beach. We stopped to hike up a hill and when we came back down, I noticed this print not far from where our quads were parked. I lined up the heel of my women’s size 10 riding boot with where I believed the bottom (heel) of the print to be and snapped this pic. It appears to be a right foot, and there's a double set of toe prints, almost like it picked it's foot up and then put it back down. We looked for other possible prints nearby but did not see any. The time was between noon and 1pm, the weather was sunny and 53 degrees. Winds were blowing in the open area of the property but we were in the thickly treed area towards the back where there was little to no wind. The days leading up to our visit there were cold with scattered showers. We chose that Thursday to go riding because it would be (relatively) warm and sunny. We were far back on the property, near a creek that separates or friends' land from an adjoining landowner's property. For information on other sightings in Virginia, check out websites like Billy Willard’s Sasquatch Watch of Virginia and William Dranginis’ Virginia Bigfoot Research Organization. In the Fall of 2013, Spike TV launched a reality show, "10 Million Dollar Bigfoot Bounty" offering the largest cash prize in television history. Got a Bigfoot Sighting to Report? Have you seen Bigfoot or Sasquatch in the area? Share it! Your sighting report will appear on a Web page exactly the way you enter it here. You can wrap a word in square brackets to make it appear bold. For example [my story] would show as my story on the Web page containing your story.